This is the BETA version of the map! For all intents and purposes, the gameplay portion of the map is complete. However, the reason it's taken me so long to release this map is because of the story. It's long and stuff. Yep, still working on that. However, I've been sitting on the complete version of this map since NOVEMBER, and have been dying to release it! So, to preserve my sanity, and to hopefully provide you with a jolly good time, I present to you the BETA version of the sequel/prequel to Terrarivania! Terrarivania: Concerto of Harmony! Please! If you encounter any issues, TELL ME! The map is in BETA, and it definitely still needs work. If you see a place where I can improve, please voice your opinion as well! I'm working hard at finishing the story for the map, so I apologize ahead of time if direction is blurred; that's all contextual and will be covered when the story is ready. However, if there are some fatal gameplay flaws, I would really like to know about them so I can fix them later! Features: Classic Metroidvania gameplay within the Terraria engine! Now with multiplayer! Approximately 8 hours in length solo, 5-7 hours in multiplayer! 5 player class-based multiplayer RPG system, with single player functionality as well! Watch as your characters become stronger as you progress deeper into Chateau de Chauvais! Rules: (These rules supercede those found on the first sign in the map, as I could not fit everything on one sign. Sorry =P) Up to 5 players allowed! DO NOT TAKE ANYTHING FROM ANOTHER CHARACTER'S CHEST! Only the premade characters are allowed (take a new one in and see why this is an issue). No pickaxes, hammers, or axes allowed. (Pickaxes found in the map are used as keys, and can only be used when allowed.) No explosives (bombs, dynamite). No picking up torches/glowsticks or using them in your inventory. NO MINING OR PLACING ANYTHING (Exceptions will be pointed out). No buying anything but Health Potions, Wooden Arrows, Shurikens, and the mining helmet from the merchant. Bosses must be fought in order to take the contents of their chest. Signs with tall torches are story signs, don't miss them if you don't want to be lost! Notes: Everything needed to progress should be available without having to suicide. Obsidian anywhere on the map is breakable, whether or not it is marked. This is the only material you are allowed to break on sight. The map is a sequel/prequel to the original Terrarivania. However, you don't need to have played that map to be able to enjoy this map (especially since the beta version is lacking story at the moment :(). The magic specialist of the group, Aidan has almost zero fighting capability if it doesn't use mana. Lowest armor level of the party, but has the most variety when it comes to magic weaponry. Has the strongest mid-game performance out of the five party members. Serves a strong utility role throughout the map. Nathaniel's brother, and the original protagonist's uncle. Father of Diana. Recommended for experienced players, but is also quite formidable in Single Player playthroughs. The jack of all trades of the group; Her primary specialty is in ranged combat, but has low-tier armor level. She has access to the second largest number of magic spells and uses spears as her side weapons. Slightly complex itemization makes her more difficult to use than Nathaniel, as well as her poor armor level. Diana has the most variety of all five members. She is the cousin of the original protagonist, and Aidan's daughter. Recommended for Beginner level players, but is challenging enough for higher level players to master. Diana fairs somewhat poorly in Single Player, so it is recommended that she be played along with a group, like Darius. The ranged weapon and consumables expert, Logan features the most complex itemization of the five characters. Has mid-tier armor level, and the widest selection of ranged weaponry of the five. He also uses shortswords as sidearms (not recommended), and is able to buy more ammo deeper in the castle. Logan is tricky to play at first, and has the worst early game performance of the five characters, but his power grows significantly as you obtain higher level gear (his growth curve is more relaxed than Darius'). Has access only to basic magic spells, but is able to have the highest movement speed of the five. Logan is a master thief that was captured by Nathaniel. Logan is being brought along on the journey to repay the debt he owes Nathaniel for trying to steal from him. Recommended for intermediate players,and his growth curve allows him to become the second best character for Single Player playthroughs. My process involves first having a general story outline and map layout planned ahead of time. 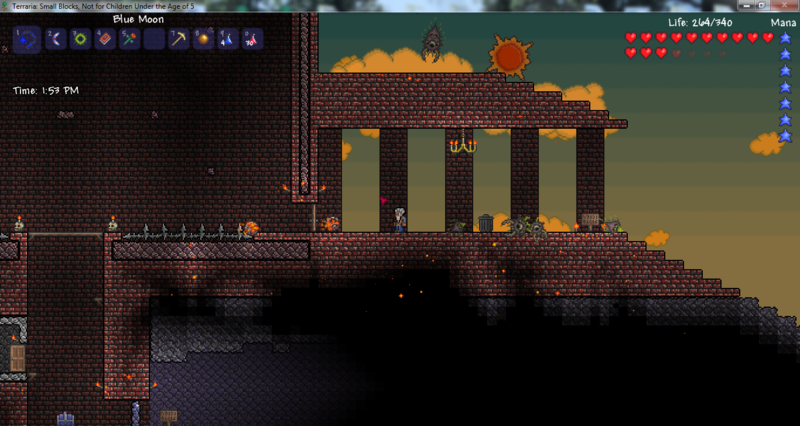 Then, I make a large amount of generated maps using Terraria's world generation. I go through each with a map viewer to check the viability of the map to fit my plans, then I pick the one that's closest to it. Then comes a mixture of editing by hand (I do this primarily when I'm working with cave systems, as can be seen in most of my maps), and creating structures with TEdit (Chateau de Chauvais is completely designed in TEdit, with some of the deeper designs, such as the catacombs, being framed around what was already pregenerated). After the map is complete, then I go through and add the equipment. Basically, the most important thing you need to do before you begin making a map is to have a general plan of what your map is going to consist of and how it's going to flow. With my method, the map begins to take on it's own life, and designing becomes simpler. Using my method, my maps end up having a more organic look to it seeing as I make heavy use of the world generation, but don't discount the importance of making sure the generated map fits your plan. Btw: Once the "complete" map comes out I am more than willing to test it solo (multi if i can convince my bro) with every character and give my thoughts about the difficulty. How did you construct the map? Was it all done by hand or did you use terraria world editor? And if you did things by hand, what parts were? (I'm trying to make a map myself but can't find an easy way to make it, nor do i have any creativity to make it look nice xD. Thanks for the feedback! Yeah, Nathaniel is supposed to be the simplest character to use, and his equipment is supposed to be a reference to the traditional Castlevania equipment (whip, boomerang, etc,). Colored lighting is a fantastic idea, I'll see what I can do! Sorry about the lack of direction, when the story is finished all of that should be covered though. I'll be so excited to finally finish the story for this map, I've been dying to tell this story for quite some time! Unfortunately, school and life have to take precedence, so I've not been able to spend as much time on it as I would have liked. In the meantime, I felt that I've been sitting on this map for far too long, I want to release it before the game updates leave me too far behind (I'm already significantly behind in terms of hard mode and wiring). I've been trying to set up the map to be suitable for multiple playthroughs, and I've found through my experience, it really is completely different when you use one of the other characters. I hope to see some players going through the map the way it was intended someday (5 man multiplayer), but I understand that it is difficult to set up something like that. For now, though, from what I can tell the map has enough variety and replayability in single player to warrant multiple playthroughs.